Ffffffffffffffffffff… It’s pages like these that make me wonder why oh why I decided a steampunk style comic, airships and all, would be a good idea. Especially airships that dock at awkward angles, therefore necessitating horrendous amounts of perspective drawing. This is probably the most difficult thing I’ve ever drawn, and I really only have myself to blame. So here we go, the airship finally arriving in Seras Daya. Also, sorry if anyone was expecting that last scene to go on longer. As if I would actually reveal details about the plot, how preposterous. 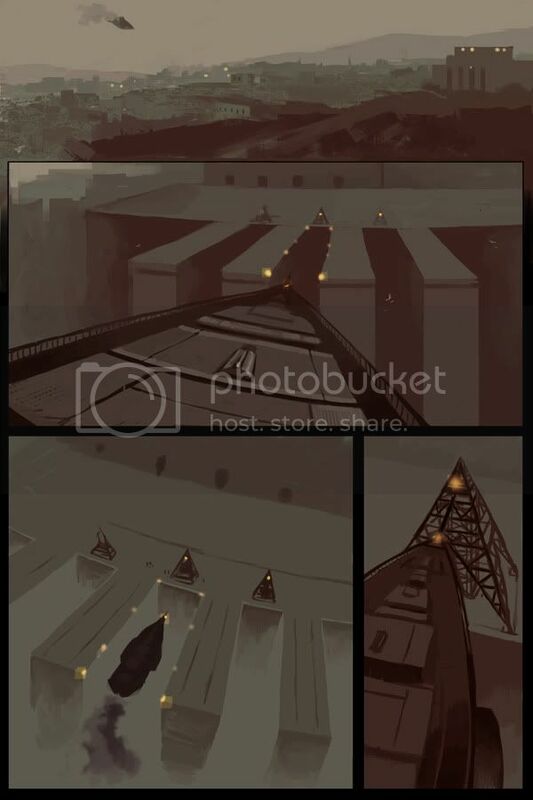 I actually didn’t notice it at first, but now that Arzadon pointed it out, the airship seems a little wonky last-panel, until you look at it again and realize it’s REALLY freakin’ big and it’s still up above the tower and the lights in the panel before. In all fairness, I think this is the first thing thing that’s thrown me off about this comic’s art, I didn’t notice until someone pointed it out, and every other element of art (even the other panels here) look friggin’ fantastic all the time. The first panel makes me happy inside. <_< Also, I wonder what this comic looks like without the rain. Whoa, the wonders of Layers. Fascinating. Also, the reason it seemed off at first was that in the third panel, I thought the dock’s lights were the same elevations as the ship’s lights, which is clearly not true as the ship is level with the tower in the fourth panel. Then I realized: No, the ship is above and still a bit to the right. This is why it looks like it’s in the center of the lights (which are necessarily lower than the light on the ship, which is what I had been judging by). It moves forward and a bit left to line up for the fourth panel. It might just be me, but the airship kinda looks like an Imperial Star Destroyer. I’m just chiming in with the usual ‘I love this comic and your artwork’ as well as to say that I didn’t find the last panel to be awkward at all. As Pandarsenic said, the bottom of the airship is in line with those eight docking lights, and the bow is exactly in line with the light on the metal mooring pyramid. I think the awesome that is the first panel negates anything that may be off in the last one. :D Awesome! I like how this comic turned out. Very coolio. Wow, I didn`t think the rain made much of a difference but it did! Keep up the good work Rose! I love this scene. It’s amazing. I want to give this scene a slow dirge or something solemn like a single clarinet played in a slow tempo with only the sound of the rain rushing as background noise. Mmm. Nothing wrong with it… better than too much fussing with it because when you see that the viewing perspective gives objects proportions that are misleading this is more like real life (where this happens all the time!) If you only had one frame to tell the whole action of docking that would be different. I like successive approximation. NO airship captain in his or her right navigation mind would attempt an approach (especially in weather with limited visibility) without first adjusting the altitude so the ship and the docking queys are at the same height. Weird Perspective Problem SOLVED! There would be no strange angular difference between the ship and dock because they would be at the same level- calling for a normal and typical perspective-line for the entire drawing.